ALICE data on photons produced in lead-lead collisions (arXiv:1509.07324) are in line with models which assume the formation of a quark–gluon plasma with a temperature of about 5 trillion degrees. This suggests that for a fleeting moment the hottest matter on earth is created in these collisions. One of the classic signals expected for a quark–gluon plasma (QGP) is the radiation of "thermal photons", with a spectrum reflecting the temperature of the system. With a mean-free path much larger than nuclear scales, these photons leave the reaction zone created in a nucleus–nucleus collision unscathed. So, unlike hadrons, they provide a direct means to examine the early hot phase of the collision. However, thermal photons are produced throughout the entire evolution of the reaction and also after the transition of the QGP to a hot gas of hadrons. In the Pb-Pb collisions at the LHC, thermal photons are expected to be a significant source of photons at low energies (transverse momenta, pT, less than around 5 GeV/c). The experimental challenge in detecting them comes from the huge background of photons from hadron decays, predominantly from the two-photon decays of neutral pions and η mesons. The ALICE experiment has measured photons produced in central Pb-Pb collisions at a centre-of-mass energy per colliding nucleon pair, √sNN = 2.76 TeV, by reconstructing with the time-projection chamber the tracks of e+e– pairs produced by the conversion of photons in the inner detectors and by measuring photons with an electromagnetic calorimeter. The same sample of photons was also used to measure the pT spectrum of neutral pions. 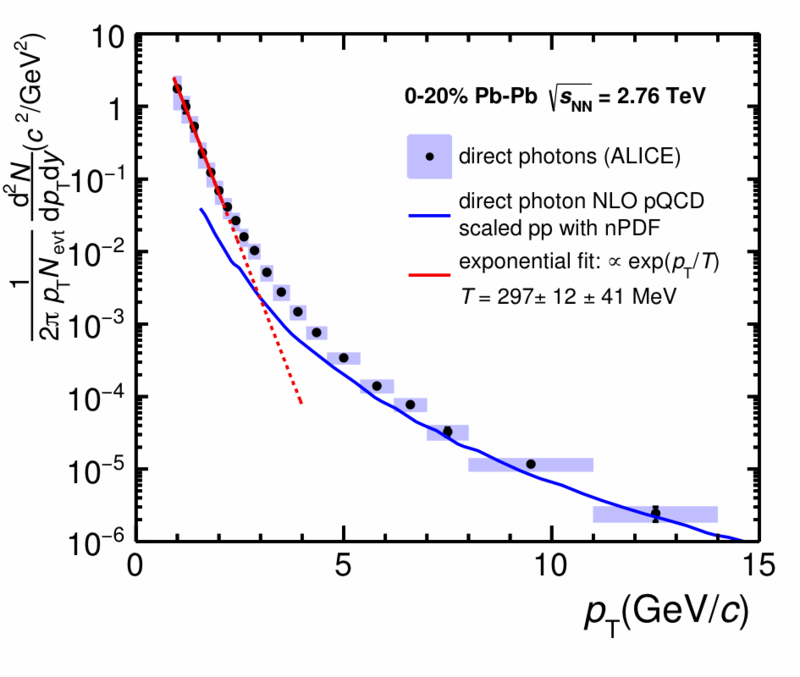 The analysis found an excess of direct photons of around 10-15% for 1 < pT < 3 GeV/c in central collisions compared with the calculated decay-photon yields from neutral pions, η mesons and other mesons, with a somewhat larger excess at higher pT. Direct photons are defined as photons not coming from decays of hadrons, so photons from initial hard parton-scatterings (prompt photons and photons produced in the fragmentation of jets) – i.e. processes already present in proton–proton collisions – contribute to the signal. Indeed, for pT greater than around 4 GeV/c, the measured spectrum agrees with that for photons from initial hard scattering obtained in a next-to-leading-order perturbative QCD calculation. For lower pT, however, the spectrum has an exponential shape and lies above the expectation for hard scattering, as the figure shows. The inverse slope parameter measured by ALICE, TLHC = 297 ± 12(stat) ± 41(syst) MeV, is larger than the value observed in gold–gold collisions at √sNN = 0.2 TeV at Brookhaven’s Relativistic Heavy-Ion Collider (RHIC), TRHIC = 221 ± 19(stat) ± 19(syst) MeV. In typical hydrodynamic models, this parameter is related to an effective temperature averaged over the time evolution of the reaction. The measured values suggest initial temperatures well above the critical temperature of 150–160 MeV (approx. 1.8 × 1012 K) at which the transition between ordinary hadronic matter and the QGP occurs. The ALICE measurement also indicates that the LHC has produced the hottest piece of matter ever formed in a laboratory.